I’ve always liked looking at the concept art for games: the drawings and paintings that formed the first concrete look of what the final experience would be. But what if a game was concept art? Forest of Liars is a game about making your way through vibrant digital paintings created by Umeshu Lovers, a studio of games industry veteran artists based in Toulouse, France. If Forest of Liars appeals to your sense of wanderlust, check out our list of the best adventure games on the PC. To bring their paintings to life, Umeshu Lovers are using the classic animation technique of parallax, where layers are created so that foreground elements are moved faster than the background, which creates a very convincing sense of scale. Artistic director Sylvain Sarrailh cites the Hudson River School movement of artists as an inspiration for his dreamlike landscapes. 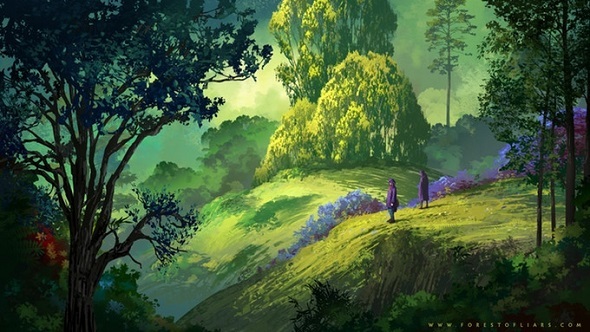 As a game, Forest of Liars is an intriguing concept as well. Players will move through a woodland labyrinth and encounter companions who will either help them along or feed them disinformation. And no two playthroughs will be the same, as the forest layout and even the characters themselves are created anew for each adventure. To solve the game’s mystery, you’ll have to work out riddles from the forest’s guardian spirits. This will require help from your companions, but you’ll have to be able to trust the information they give you. How combat encounters and other gameplay elements will work isn’t completely clear yet, and Umeshu Lovers have launched a Kickstarter campaign to fund the remaining development. It’ll be interesting to see how this project shapes up, but I’m content for the time being to stare at the Forest of Liars’ beguiling wilderness.